The Red Zone with Russ Bliss, your Fantasy Football Guru, teams up again with Santisi Brothers Pizzeria & Sports Grill. Listen to Russ every Tuesday and Wednesday from 6pm-7pm. Join him live at Santisi Brothers to enter the Santisi Brothers Fantasy Challenge and win great prizes! Santisi Brothers Pizzeria & Sports Grill is located at 2710 W. Bell Rd in the Bell Canyon Pavilions, just west of I-17 on Bell Road. Russ Bliss has hosted The Red Zone since 1997, making it one of the longest running continuous fantasy football radio shows in the world, if not the longest running still on the air. Starting on what is now NBC Sports Radio AM 1060, he has hosted the show on that station until now. During that time he also hosted shows on Sirius/XM on the Sports Byline USA Network and also a local show in Pittsburgh, PA. For 14 seasons Russ was the lead fantasy football analyst and general partner of a very successful fantasy website. During that time, he received recognition from Bloomberg News, Pro Football Weekly, and his blog “Tips From The Red Zone” was recognized as one of the top Fantasy Football Blogs by the Wall Street Journal. Russ’s partnership with Santisi Brothers Pizzeria and Sports Grill began in 1999 when he started making appearances and promoting the Fantasy Challenge there once a week. In 2001, after leaving a full time position as a sports radio personality, Russ partnered with Santisi Brother’s and NBC Sports Radio AM 1060 to continue doing the fantasy football radio show. 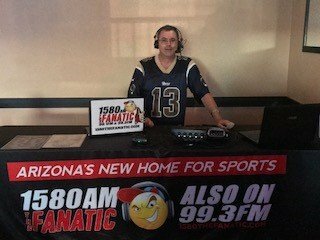 The show’s huge success is both a testament to how Russ treats his callers and those who come into Santisi Brother’s to meet him and play the Fantasy Challenge, along with showing the highest quality of Santisi Brother’s as Arizona’s Premiere Sports Grill Restaurant. Russ and Santisi Brothers are excited to be joining AM 1580 The Fanatic in 2017!